You are here: Home / Crafty Stuff / Back sewing! So I purchased the Shirt, Pants and Dress kits from Sure-Fit – and left them sitting in the cupboard. Fast forward six months. Dian and I were in Addicted to Fabric and saw a display skirt they had there, for a kids sewing class. It was in a heavy cotton fabric, with a pom-pom trim, and was a simple rectangle gathered with elastic at the waist. So we bought the fabric and trim, and they also sat there for months. Finally I pulled out the drafting tools, made the skirt pattern and…. left them sitting there for months! I’m seeing a pattern here…. Finally I sat down and made it. In only a couple of hours. It’s an A-Line skirt, as Dian wanted a more grown up and tailored look than the display one. It fits well, and has room to grow, and Dian loves it. Just as she pictured it. Full skirt shown, and then the back view which is pretty much identical to the front except for the zipper. Today I found my sewing mojo. It’s been awol. I’ve learnt how to do an FBA (Full Bust Adjustment) on garments so they fit. I’ve been inspired by reading other people’s sewing blogs. Bring on the sewing! Gorgeous skirt 🙂 Well done on finding your sewing mojo again. Thanks Melissa! I’m looking forward to fully using that mojo while it’s here! Hello Melinda, great skirt to kick off a new burst of sewing. Re the paper cut leggings – the instructions are for straight stitch on presumably a conventional machine and an overlocker for finishing. I used a really narrow zigzag 1.5×1.5 on my conventional machine for the construction. This is what I would use for the topstitching if I did not have a coverstitch. I would not use a straight stitch as the leggings need to be tight IMO – negative ease, and I think this makes straight stitching pop unless you sit perfectly still the whole time you are wearing the garment. ;). You can definitely make them without a coverstitch. Thanks Karen! Straight stitch on stretch? I wouldn’t use straight stitch regardless of what the instructions say. 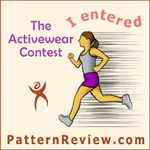 I’m looking forward to receiving my pattern and making some running leggings! I do like this skirt. Maybe it’s the fabric, the fit and/or the trim. It does work. Now that you’ve got the FBA adjustment sorted, you’ll just get used to doing this adjustment when you start a project. I do plenty of adjustments because I enjoy a well fitted dress/pants, skirt. Glad you got your sewing mojo back. I really like it too – the fabric is gorgeous. I’ve considered making a jacket from it!